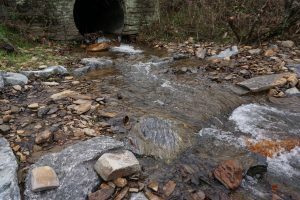 A federally protected fish has been found living in a tributary to the Little Tennessee River following restoration work this fall to provide easier access for minnows and other diminutive fish. 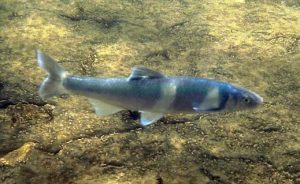 Not long after work was done to improve access through a culvert on Licklog Creek near the Swain County line, the spotfin chub was found swimming up the stream that feeds into the Little Tennessee. The spotfin chub is listed as “threatened” under the Endangered Species Act. It’s typically found in only a handful of rivers in the country, one of which is the Little Tennessee. Its habitat is designated as the larger rivers it’s been found in, though, without any mention of the smaller creeks and streams that lead to these rivers. Bill McLarney, senior scientist with Mainspring, found that the critical habitat designation painted an incomplete picture of the fish’s habitat and movement patterns in this part of North Carolina. Rocks were placed in small increments around the culvert to raise the water level so fish could swim into the culvert to get to Licklog Creek. Spotfin chub and other minnows were found moving in and out of tributaries up and down the Little Tennessee during the fall, and several of these smaller waterways were obstructed by man-made barriers. In several locations, culverts had been installed that resulted in drop-offs of a foot or more that fish could not navigate, effectively blocking them from accessing the tributary. One such culvert is located on Licklog Creek, close to where it meets the Little Tennessee. Before, the mouth of the culvert dropped 12 inches into a small pool, preventing fish from swimming into the culvert. The smaller increments allow fish to travel upstream and through the culvert without having to make an impossible 12-inch leap from a small pool into the mouth of the culvert. Meador said there has been a concerted effort on Mainspring’s part to address these types of blockages for the past several years. The worst impediments, he said, are relatively easy to locate due to their effect on fish movements. “We can identify barriers really easily, because the fish just pile up in a pool as far up as they can go,” Meador said. 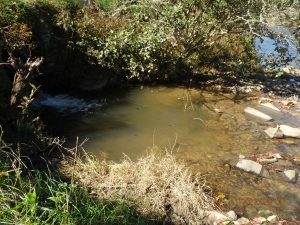 By locating these dense concentrations of fish in small pools along the tributaries, Meador, McLarney and others can find places that have limited access and improve them. They’ve done numerous such projects in recent years, Meador said. While the spotfin chub acted as a catalyst for this project and several others, Meador said it’s not the only fish that will benefit from the improved tributary access. According to McLarney, these access projects are just one part of a large number of efforts Mainspring and other groups undertake to improve stream health and conserve the species that use the various streams and tributaries along the length of the Little Tennessee.